Tioga County’s local Case dealer, Monroe Tractor, assisted multiple municipalities in environmentally sound, necessary projects to protect, upgrade or restore ailing infrastructure. Awarded with the first Dire States grant in 2016, the Tioga County Soil and Water Conservation District (SWCD) in Tioga County, N.Y., used the grant to supplement its Environmentally Sensitive Stream Maintenance Program. The program is in place to mitigate damages from flooding events, which have had considerable impact on the local infrastructure and the community. Tioga County's local Case dealer, Monroe Tractor, assisted multiple municipalities in environmentally sound, necessary projects to protect, upgrade or restore ailing infrastructure. One of the completed projects was an undersized culvert in the Town of Berkshire. The culvert was damaged in storm events and was a barrier for aquatic life passage. In addition, an 8-ft. drop off continued to erode and created a dangerous safety issue for the community. The SWCD used the Dire States Grant to assist in the construction and installation of two new culverts. Both culverts were replaced to the appropriate width, set at an elevation to promote natural stream bed materials to fill the bottom of the culverts. Culverts were installed and constructed with rock riffle on both the up and downstream passages. The highway superintendent and staff assisted in the installation process, encouraging shared services and hands on training for municipal staff members. Other projects completed by Tioga County with the help of Case's Dire States Grant included channel realignments on the Piester Stream channel and on Davis Hollow Road. 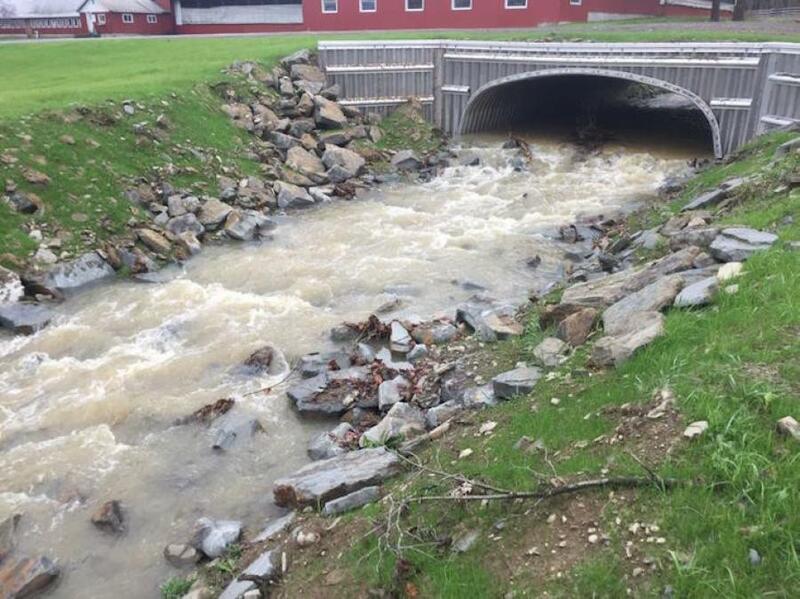 Emergency repair work caused by flash flooding was completed on Sackett Creek in the Town of Nichols. Lastly, the Diamond Valley Road Bridge received a stream bed repair after storm events threatened a home upstream of the bridge. Since its inception, the community building grant has been awarded to two important infrastructure projects that have made a direct impact on the people of those communities. In 2017, Quincy Township, Pa., won the grant for replacement and repair work on the Old Forge Bridge — a deteriorating bridge in an important location that risked access to residents, as well as fire departments, ambulances, police, school busses and other essential components of the community. The grant is named for Case's infrastructure awareness and advocacy initiative, Dire States, which evolved from a national tour in 2013 that focused on raising awareness of America's ailing infrastructure into active campaigning for specific programs and legislation. 2018 is the third year that Case Construction Equipment has offered the Dire States Equipment Grant. The grant provides one winning community with $25,000 in free equipment use to help offset the costs of building or repairing a critical piece of local infrastructure.